Massive Forced Abortions in China! CHINA—Recently, governments in Shandong and Guangxi Provinces are forcing pregnant women to abort their babies. Among these pregnant women, some of them are in the late stages of their pregnancy. After being injected with drugs, a Christian who was seven months pregnant gave birth to a dead child on April 18. The nine month old fetus of another woman did not move for 48 hours after she was forcibly injected with drugs. Birth Control Departments and hospitals in Guangxi Province refuse to respond to the reporter's questions about the forced abortions. According to information from the China Aid Association released on April 17, in Texas in the United States, a large scale mandatory abortion program is being carried out in Baise City, Shanxi Province in China. In the People's Hospital in Youjiang District, Baise City alone, there were 41 pregnant women being forcibly injected with abortion drugs on that day. Wei Linrong, a Christian who was seven months pregnant was one of them. On the morning of April 17, ten officials from the Baise City Birth Control Commission broke into Wei's home. They kidnapped Wei to the Youjiang People's Hospital and forcibly injected her with an abortion drug. Our reporter called Wei's husband, Pastor James Liang on April 18 and learned that Wei gave birth to a dead boy. Liang told the reporter that Wei was given the injection at 11 a.m. on the April 17 and had a miscarriage at 6 a.m. on the April 18. Liang didn't know what kind of injection Wei was given. After giving her the injection, the fetus was left to die slowly in the uterus. Liang and Wei already have a child. Liang told the reporter the pregnancy was an accident. They didn't mean to violate the government's birth control policy. He Caigan was another victim in the same hospital. She was nine-months pregnant with her first baby. The Baise City birth control department claimed that because she had not turned 18 and did not have a marriage certificate, they forced her to give up her baby. According to He, the hospital didn't tell her what drug was used. The hospital staff put two injections into the fetus's head. 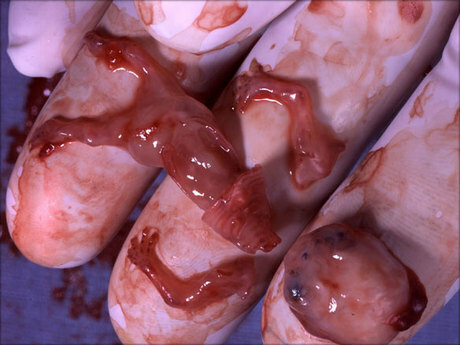 The fetus did not move for 48 hours after the injections. She said: "I was scared. I closed my eyes when they injected the drugs. After the injections, the baby kicked and moved continuously for 20 minutes and then stopped moving. It hadn't moved since then." She wanted the baby but said she couldn't do anything since it was the government's decision. She also saw another woman in the same hospital who was nine months into her pregnancy being injected with an abortion drug as well. Our reported called the Youjiang People's Hospital on the April 18 to inquire about Wei and He's situation. Reporter: The Hospital forced 41 pregnant women to abort. How come a nine month pregnancy was still forcibly aborted? Staff: Who told you that? We don't abort those who are due soon. Reporter: What about Wei Linrong? She was seven months into her pregnancy. She was injected with an abortion drug and gave birth to a dead baby boy this morning. Staff: Why don't you come to the hospital and see for yourself. I am not obligated to answer your question. Reporter: Did the Birth Control Commission send anyone to the hospital? Staff: Yes, there was a group of them. Reporter: Are they stationed there? Staff: Yes. You have to come over here if you have any more questions. A close friend of Wei Linrong told the reporter: "This [forced abortion] was arranged by the Birth Control office. They often send people to force civilians to go to the hospital for abortions." In the one hour while the reporter was trying to gather information from various government officials, the Youjiang People's Hospital forcibly injected another dozen pregnant women with abortion drugs. In Laizhou City, Shandong province, a 39-year-old Christian, Xu Hui, who was accidentally pregnant with her second child was also forced by the government to abort her baby. She was six months pregnant.